I’m sitting inside a Chick-fil-a right now. 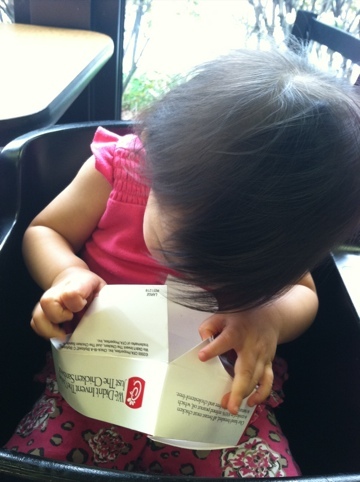 I don’t get CFA (as we junkies call it) very often because the only one close to my house is in the mall, and getting out of the car toting a one-year-old just for a chicken fix kind of defeats the purpose. But the stars aligned, and after numerous errands on the other side of town, I find myself sitting in the swankiest fast food restaurant chain in America. I love this place. I love that everyone who works here acts genuinely pleased to hand me a giant sweet tea, as if I just fulfilled the prophecy of Combo #4. I love that they give me sticky place mats and packets of Purell (FOR FREE!) because they see me carrying a baby on my hip, then offer to bring my food to me so I don’t have to treat the entire staff to my juggling act (as impressive as it is). I love that in the time I’ve been sitting here, someone behind the register has greeted a customer BY NAME no less than four times (and not the way Starbucks acts like we’re BFFs just because I told them my name so they could write it on my cup in case I blanked later). I love that they have Hospitality Staff making the rounds, topping off drinks and cooing over children (although, to be fair, cooing over my children is an automatic win in my book). I love their Polynesian sauce, which I’m pretty sure is made out of manna from Heaven. I love that most, if not all, of my memories of sitting inside a Chick-fil-a with endless Dr. Pepper are tied to significant, soul-feeding conversations with some of my favorite people ever ever ever. I also love those cows. They’re so illiterate! So tell me…are you craving chicken yet? MOM ATE ALL THE CHICKEN! Can you believe I’ve never been? I don’t know if we have one within a 60 mile radius, but I kind of want to find out. Will Google and report back. I hope so! It’s mainly a southern chain but I think they’ve branched way way out recently. But I’ve never been to CFA. Please go. ASAP. You don’t even have to bring your kids. I have not heard of the institution. Another reason to plan a road trip to TN! The reasons just keep racking up. Reason #634: pumpkin cheesecake. A local restaurant here (not CFA) makes THE best. I love the whole Chik-Fil-A institution and philosophy. Have you ever read Truett Cathy’s book Eat More Chicken? Excellent read. No I haven’t read that one. I’ll have to check it out! We got one a couple years ago and I’m hooked too. It’s like crack. Christian-infused crack. although I am definitely craving chicken now! And an endless supply of Coke doesn’t sound too bad, either (although it never would)… I wouldn’t mind having cola on tap in my kitchen! Mission accomplished. I’m so much more effective than those cows. CFA is one of our favs! Fast food, as it usually goes, is nasty but somehow CFA redeems the fast food industry. I love that they sincerely stand by their principals and beliefs (closing on Sunday, playing Christian music etc.) and are not ashamed to be what and who they are. CFA is one of those places that could go either way: sit-down restaurant or fast food? Shoot, I’d have a birthday dinner there. I’ve never heard of this little piece of fast food heaven. BUT…now I really, really want to go! You and Leanne can roadtrip it down. It’ll be a Canadian invasion! We lovingly refer to it as “Christian Chicken” here. During a college internship south of Atlanta I’d eat at the original Dwarf House (Truett Cathy’s first restaurant) where it was an actual sit-down with servers and real plates. The only thing different on the menu was the chicken breast by itself, roll and mashed potatoes. Is the Dwarf House still standing? Because eating there just landed on my bucket list. Right under Attending a CFA Opening so I can win free food for a year.